It began on Saturday morning, May 27, 1893, in Kingfisher, Oklahoma Territory—an appropriate time in an appropriate place. The town, founded only minutes after the Land Run of 1889, still had the rough edges of its frontier birth, with wood framed buildings filling most of the lots on one block of Main Street and a scattering of homes that created an image town boosters called promise. Off to the west was the old Cheyenne and Arapaho reservation, opened to non-Indian settlement only the previous year. To the south, beyond the Canadian, was the Chickasaw Nation, where an ancient Indian culture was fighting a losing battle against intruders, allotment, and assault on tribal sovereignty. To the east, on either side of the Santa Fe tracks and a few frontier boomtowns were several thousand farm families scratching a living from their 160-acre homesteads. To the north was the Cherokee Outlet, a vast ranch land soon to be opened by the largest of the land runs. Caretakers of the OHS’s growing collections in 1910 included, left to right: Edith Knean, file clerk; Lon Wharton, secretary; Jasper Sipes, president; and W. P. Campbell, historical custodian (20058, Oklahoma Historical Society Photograph Collection, OHS). New programs, new staff, and growing collections led to greater demands for a permanent historical building. As early as 1909, an organization in Oklahoma City called the Women of ’89 had campaigned for a new building, adopting the motto “Our Work: A State Historical Building.” Board members and staff joined the chorus, but little happened until 1919 when patriotic groups suggested a $500,000 memorial arch for the veterans of World War I. 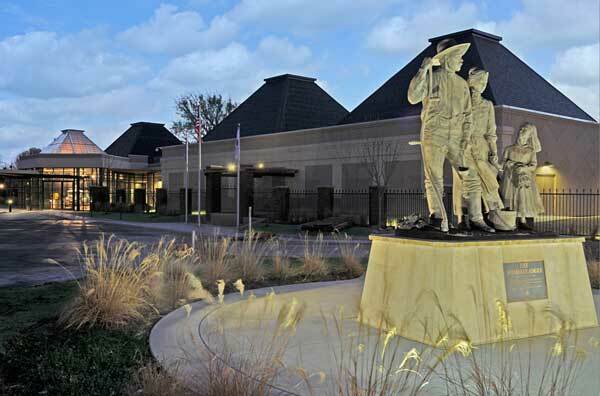 Why not, reasoned outgoing governor and OHS board member Robert L. Williams, take that same amount of money and construct a historical building that would also be a memorial to Oklahoma’s veterans. Williams and other political forces halted plans for the arch, but without the substitute building. Funding was not the problem, thanks in large part to a provision added by Congress to the bill opening the Cherokee Outlet. In that authorization, Congress had set aside two additional sections in every township for the support of public buildings. The land was transferred to the state in 1907 and could be leased or sold to raise money for construction. Throughout the 1920s the board of directors regularly called for a new building using this source of funding. While the “Temple of History” did not prompt an increase in staff or appropriations, it did allow for new initiatives and the expansion of collections, most notably American Indian records. Since 1908 the society had sought the records of the Union Agency in Muskogee, where, stacked like the treasure it represented to historians, were several million documents dealing with agency business as well as records on the governments, courts, and tribal officers of the individual Indian nations. The Oklahoma Historical Society Building under construction, April 1, 1930 (6429, Robert L. Williams Collection, OHS). Despite that monumental achievement, the society had little hope of avoiding cuts in appropriations and staff due to the Great Depression. The leadership fell back on the three “R’s”: room, records, and resourcefulness. The new building provided adequate space for new projects, and the results of more than forty years of collecting offered countless opportunities for arranging, processing, and utilizing historical materials. In the best tradition of resourcefulness, the leadership coupled those assets with new federal programs designed to “make work” for victims of the Great Depression. The public works projects conducted by and for the society signaled a change in attitude that had been building slowly for the past decade. The change was from an introverted, “collecting” institution to one that also stressed outreach and activism. Part of the explanation was the new, more aggressive role of government, going beyond passive service to becoming an agent of change. Added to this was a new regionalism, a sense that the people of Oklahoma and the Southwest shared a common heritage that should be celebrated in music, theater, literature, and history. The Chronicles, first published in 1921, was an early sign of this new spirit; the Indian-Pioneer Papers was another. Whatever the reasons, from the 1930s forward, the society would increasingly look beyond its walls in Oklahoma City to build a statewide base of support through outreach. 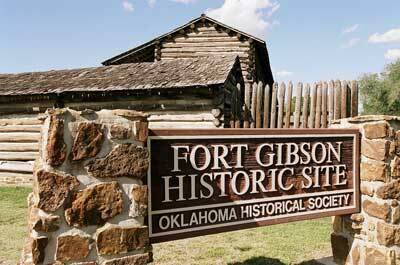 Fort Gibson was the first historic site owned by the OHS. Hunter’s Home in Park Hill. The Oklahoma Territorial Museum in Guthrie. While the new enthusiasm for outreach programs grew progressively strong during the three decades after World War II, the primary focus of the board, the staff, and even the public still remained on the programs within the walls of the historical building in Oklahoma City: the library, the archives, The Chronicles of Oklahoma, and the museum. The result was a gradual increase in the size and complexity of traditional programs, a growth based not so much on increased appropriations, which remained relatively flat until 1970, but rather on the tried and true strategy of resourcefulness. The microfilm revolution also affected the library, where the compact size and relatively low cost of film overcame the limitations of space and budget. It also made possible the acquisition of statistical collections such as United States census data, which in turn attracted a distinct and growing group of researchers and genealogists. There always had been an element of genealogical interest in the book and periodical collections, but it was limited largely to mug books, biographies, the 1890 Census of Oklahoma Territory, the Dawes Rolls, and the biographical indexes prepared by WPA workers in the 1930s. Although these were appealing to family historians, most of the data dealt with the time period after 1890. That self-confident attitude was made possible in large part by the rich diversity of the museum’s holdings. After a half-century of collecting, there was a large volume of American Indian artifacts, from moccasins and wedding clothes to cradleboards and war shields. There were political buttons, farm implements, desks from the Constitutional Convention, toys, quilts, Wild West Show posters, inaugural gowns, a hammer used to kill the first cow at the Oklahoma City Stockyards, glassware, guns, a flag carried by the Choctaws into a Civil War battle, stained glass, cameras, the Seminole execution tree, lace, photographs, postcards, and an impressive art collection that included Cavalcade, a painting by Alfred Jacob Miller. The responsibilities of the Publications Division had grown gradually over the years, beginning with The Chronicles of Oklahoma in 1921 and expanding in the 1940s with the production of brochures, booklets, and historical markers. In 1949 the executive director published an OHS newsletter for a short time, but like its predecessors Historia and the original Mistletoe Leaves, it was not sustained. Even with these new duties, the preservation office continued to play an important role in the expansion and development of the society’s historic sites program, especially in the 1970s when “bricks and mortar” money flowed freely out of Washington. Large grants were invested in Old Central, Fort Washita, the State Capital Publishing Museum, Parris Mound, and the Drummond Home, a site accepted by the society in 1980 with a private gift of $100,000. But the pace of site and museum acquisition had slowed, affected first by Governor Boren’s veto of 1975, then by the Congressional decision to eliminate “bricks and mortar” money from the SHPO program. The final blow to the long period of expansion was the state budget crisis after the crash of the oil boom in 1982. The changing dynamics of state and federal funding led to a crisis in the long-term development of sites and museums under the society’s umbrella. Typically, when the properties had been accepted, recurring base appropriations were never enough to cover more than utilities and only one, or in a few cases, two staff members and no support staff at headquarters. Restoration projects and even simple repairs depended on federal grants or line-item appropriations, two sources that diminished in the late 1970s and virtually disappeared in the early 1980s. Once again, the boom and bust cycle of Oklahoma’s commodity-driven economy, combined with the political realities of relying on the state legislature for all funding, threatened the society’s ability to sustain dynamic, long-range plans that might take years if not decades to mature. Clearly, it would take more than overachieving individuals and occasional spikes in funding to turn the corner to a new chapter in the evolution of the OHS. It would take organizational stability, a higher level of self-determination, and a new business plan. As with any organization, whether in the private or public sectors, the stability for sustainable growth had to start with a balance of structure and personal leadership. Although many people did not recognize the significance at the time, the turning point was reached in 1981 when the society adopted a new constitution and bylaws that honored some traditions but added needed reforms to the way the society was governed. The next step in securing a solid footing for future success was a set of planning tools that would set goals, both short-term and long-term, and provide the necessary templates to evaluate success or failure. Too often in the past, that determination had been left to individuals and groups with narrow interests. With planning documents, reviewed periodically and used as the starting point for new policies and programs, the stage would be set for unified action and an internal decision-making process that would start with the board of directors and expand to the executive team, the staff, the volunteers, the membership, and potential partners. By the early 1990s, still buffeted by the winds of the state’s economic meltdown following a bust in the oil patch, the society’s leadership realized that the stable foundation of governance would support a new business model in terms of how the OHS served the greatest good for the greatest number of people in the state. Although not articulated this clearly in the beginning, the new business plan emerged from the rolling five-year strategic planning process with two parts. One was a mission statement that simplified and unified everything under the society’s umbrella. The new mantra was to “collect, preserve, and share Oklahoma history.” The flip side evolved into three key practices: higher standards, greater efficiencies, and partnerships. The two parts of the business plan would become touchstones for the next twenty-five years. 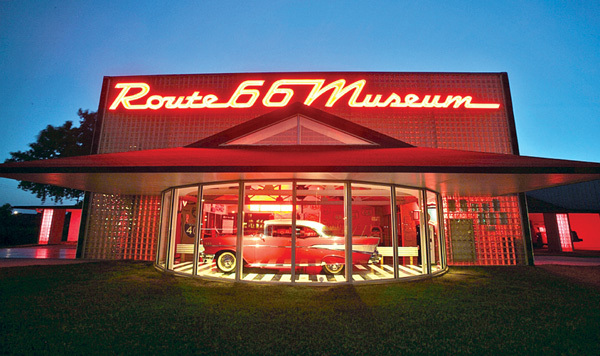 The Oklahoma Route 66 Museum in Clinton. The marching cadence of higher standards, greater efficiencies, and partnerships pumped energy into other parts of the society’s operations. At every OHS museum and historic site, local support groups created 501(c)(3) foundations to raise money, share operational duties, and undertake investments that could be done more efficiently and quickly outside the limits of state processes. With partners at their sides, the society board and staff raised their expectations and sponsored big events such as annual Civil War reenactments, Pawnee Bill’s Original Wild West Show, and the Fur Trade Rendezvous. Living history, which depended on volunteers, elevated the brand of the society and generated a steady stream of press coverage. 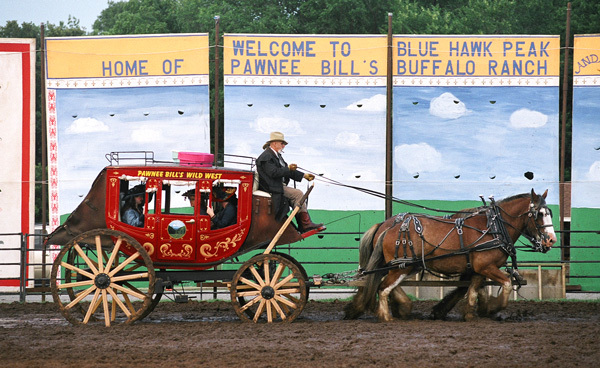 Pawnee Bill’s Original Wild West Show is one of the OHS’s premier living history events each year. 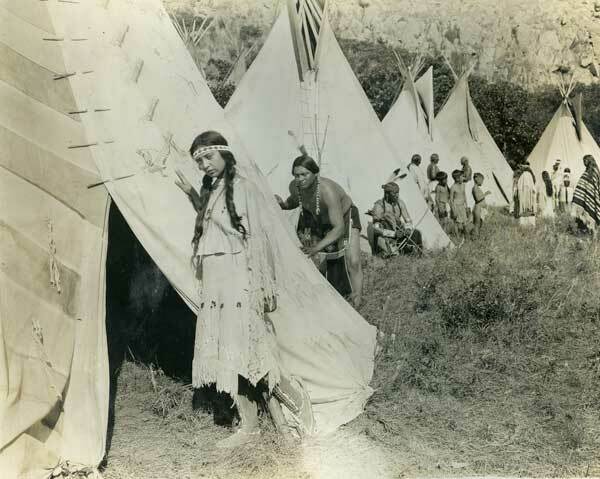 A still from the film The Daughter of Dawn, restored through the efforts of the OHS and now a part of the Library of Congress’s National Film Registry. Even the Publications Division flexed new muscles with a series of books that raised money, secured collections, or supported exhibits. The most notable achievement, one which will continue to do more than any other single program to promote a greater understanding of state and local history in the future, was The Encyclopedia of Oklahoma History and Culture. With three grants from the National Endowment for the Humanities and a talented editorial team of staff members and volunteer authors, the project took more than six years and 2,455 entries to span the range of Oklahoma history as described in the Historic Context Review. The two-volume work, released in 2009, was adapted to a digital format and posted online as a free source of historical information available to anyone with access to the internet.57 During the 1990s, as the society climbed out of its old comfort zone of acceptable mediocrity, it became painfully clear that the stately Wiley Post Historical Building completed in 1930 no longer matched the ambitions of the organization. The problems included no room for expanding collections, small gallery spaces that limited creative exhibit plans, and environmental conditions that were antiquated by modern museum and archival standards. When the society agreed to be the Smithsonian Institution’s concluding destination for an exhibit about Woody Guthrie, two dozen humidifiers and dehumidifiers could not get the air quality of even one room up to Smithsonian standards. 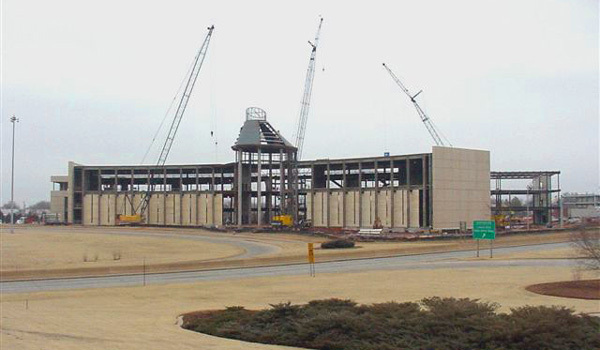 The Oklahoma History Center under construction, c. May 2003. The opportunity to create large and elaborate museum exhibits helped convert the OHS from a passive receptor of donations to a proactive collector seeking objects with stories. 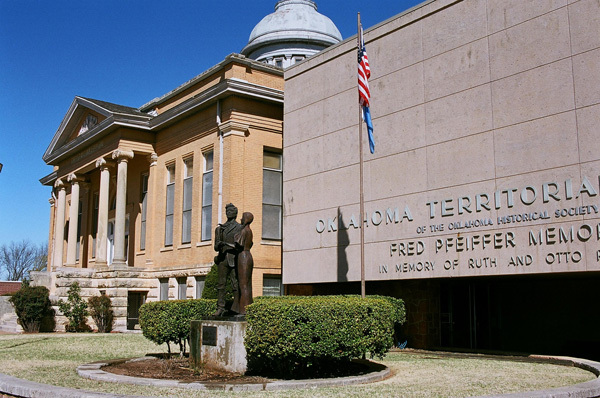 Some efforts filled traditional deficiencies recognized in the Historic Context Review, including exhibits about the African American experience, Latinos in Oklahoma, and the Asian community. Another gap filled by looking ahead was the John Dunning Political Collection of more than three thousand priceless items that populated one entire exhibit on the way political campaigns have reflected public attitudes since the 1890s. To celebrate the centennial of statehood in 2007, the Oklahoma History Center mounted an exhibit describing the early lives and influences of the governors of Oklahoma entitled Inspired to Lead: The Governors and First Families of Oklahoma. For the opening reception, the seven governors who were living at the time gathered to be honored. 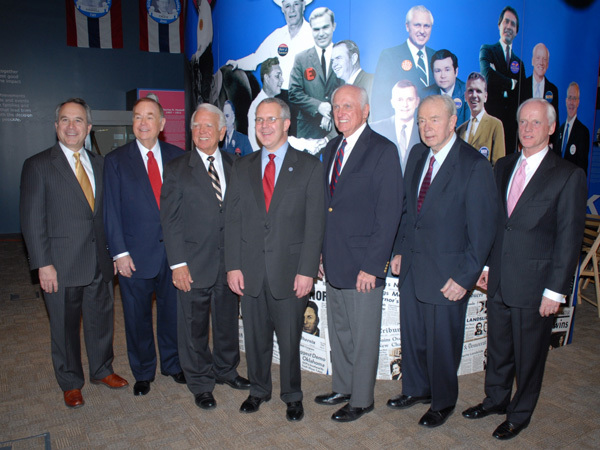 Left to right: David Walters, David Boren, George Nigh, Brad Henry, David Hall, Henry Bellmon, and Frank Keating. Surprisingly, two deficiencies in the collections exposed by the lofty possibilities of the History Center were both associated with free enterprise and economic development. By launching the Devon Energy Oil and Gas Park outdoors, the OHS started an ongoing collection process that now includes four derricks, hundreds of exploration and drilling tools, trucks, seismograph equipment, service station pumps, and a driller’s cabin simulator to illustrate the importance of oil and gas to Oklahoma history. Filling other gaps in business history came with the eight-thousand-square-foot exhibit Crossroads of Commerce: A History of Free Enterprise in Oklahoma . 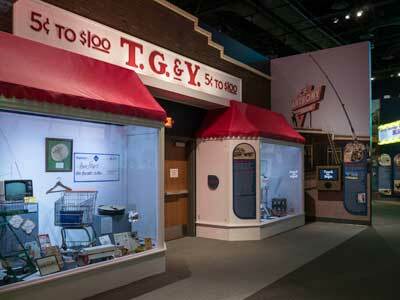 Other examples of using exhibits to build collections were Another Hot Oklahoma Night: A Rock and Roll Exhibit and Oklahoma at the Movies, which started a conversation about the need for a museum dedicated to popular culture. 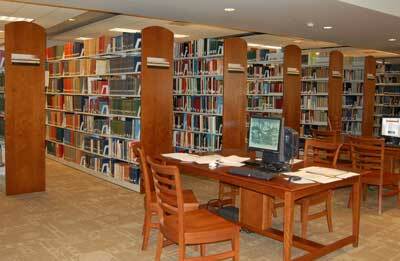 The Research Center inside the Oklahoma History Center maintains partnerships with organizations like Ancestry.com to provide research services to patrons. In some ways, the Oklahoma History Center was a beachhead on the urban frontier of political and financial support. Not only did the building make an impact on collecting and sharing history, but it also filled a gap as a community center in the State Capitol Complex. For public and business associations involved with government, the History Center became a popular spot for receptions and banquets. For schools and social organizations, it became a place to learn and celebrate shared heritage. For brides and grooms, it became a place to commit a lifetime of devotion to one another. In 2017 the Oklahoma History Center hosted more than four hundred outside groups and families, generating both goodwill and a stream of revenue to blunt the impact of budget cuts. When combined with more than five hundred events and programs offered by the OHS every year, the History Center became a community center open to everyone. That success in one urban community reinforced a long-held opinion among society leaders that the people in and around Tulsa were not being served as they should be. When it was just the old Historical Building, which looked more like a tired public institution in a landscape of gray buildings, few people cared. With the quality and success of the History Center, the contrast was clear to all. Something had to be done to solve the inequities in the way the public was served. From 1865 to 1920 African Americans created more than fifty All-Black towns in Oklahoma. This is a panel from the Oklahoma History Center’s traveling exhibit All-Black Towns of Oklahoma. OHS leaders had long reached out to Tulsa but with little sustainable success. In the 1980s, when the OHS resurrected its annual conference, the first site was Tulsa. In the 1990s, as Tulsa approached its centennial, the OHS stepped up to help upgrade the Tulsa Historical Society. When the legislature allocated resources to create a Tulsa Race Riot Commission, the OHS became the lead agency gathering evidence, holding hearings, and encouraging dialogue and reconciliation.64 At one point during the state centennial, OHS leaders explored the idea of buying Cain’s Ballroom as a site for a folklife center and museum. Without a physical and permanent presence in town, none of those efforts could be sustained. Something more had to be done. OKPOP, which currently is under development, will be located across the street from historic Cain’s Ballroom in the Tulsa Arts District. In 2009 an effort to seek a state bond issue to match a private fundraising drive was launched. Early efforts came up short, but Tulsa supporters, creative artists, and the OHS Board and staff did not waiver. Six years after the first serious effort to get the funds, the legislature approved a $25 million bond issue for OKPOP.66 As the author writes this history, a donor has dedicated land across the street from Cain’s Ballroom as the site for the museum, the planning staff is gathering collections, ideas, and friends, while the educational, business, creative, and tourism communities of Tulsa are embracing the project. 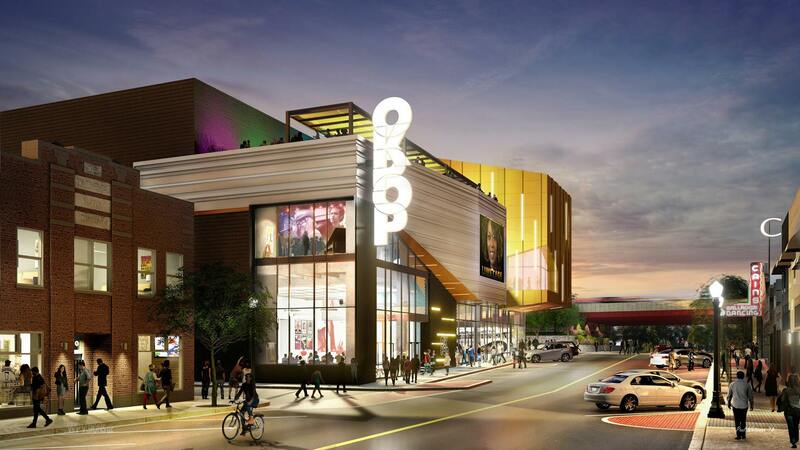 In 2020, after OHS leaders and friends raise $10 million for exhibits and collections, OKPOP will open and fill a gap in serving the people of Oklahoma. In 2015 the History Center opened an exhibit entitled Crossroads of Commerce: A History of Free Enterprise in Oklahoma. The ability to not only survive this perfect storm of turbulence, but also to actually move ahead with major initiatives, was linked directly to the achievements of the business plan that had emerged from the 1980s. On the financial side of the storm, the ability to generate a growing stream of revenue, combined with the generosity of support groups and donors who recognized the unwavering commitment to higher standards, backfilled some of the financial gaps and supported a master plan that recognized weaker programs of the OHS might have to be shifted elsewhere while the greater potential of others should be saved and strengthened. As in any business, public or private, painful decisions have to be made from time to time to keep an enterprise viable and vigorous. In government, where resistance to change comes from all directions and the temptation to take cover is strong, troubled times occasionally provide the opportunity for bold action to correct the course of history. Despite taking the highest percentage of the 48.6 percent cuts from 2009 to 2018, the programs housed at the Oklahoma History Center had greater access to the fruits of the new business plan. Rental income actually grew as community groups recognized a commitment to keep standards high. In previous decades, money might have been taken out of maintenance and housekeeping to keep staff, board members, and legislators happy. During the crisis, sacrificing quality was never considered. And donations and collections continued to grow, stimulated by launching an aggressive schedule of new exhibits and programs supported by foundations, businesses, and individuals willing to share resources. While higher standards and partnerships kept the History Center’s financial ship afloat, the willingness to adopt greater efficiencies squeezed new value out of shrinking budgets. In the executive director’s office, the traditional duties of the deputy director were filled by the chief financial officer and a shuffling of responsibilities to three survivors. In the Research Division, managers shifted duties to part-time employees and expanded digital services to other state agencies willing to share their collections along with a stream of revenue to pay for the services. In all program areas, a greater emphasis was put on volunteers and support groups who recognized the needs and responded to the call for action. The Cherokee Strip Regional Heritage Center in Enid. Other communities and partners responded as well. In Altus the local director convinced OHS leaders that she could invest a little money to attract even more. The results were the addition of a relocated ranch house to the museum grounds, two new exhibit galleries, a reinvigorated volunteer force, and a reputation in the region that the museum could make a difference in the quality of life. 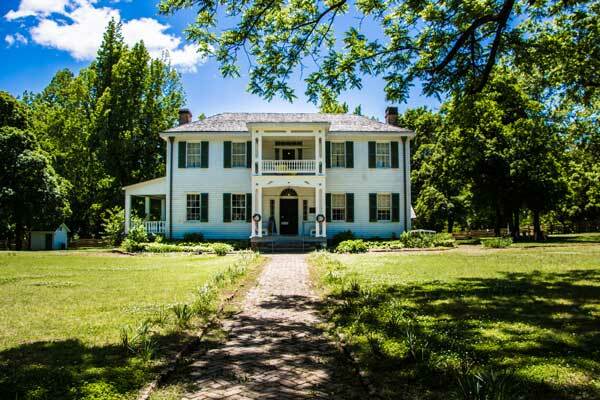 Similar stories unfolded at the Murrell Home, where the Cherokee Nation is partnering with local supporters to create an 1850s-era living history farm, and at Honey Springs Battlefield, where the local support group raised and borrowed more than a $1 million to build a new interpretive center. Once again, higher standards, greater efficiencies, and partnerships combined to blunt the brute force of budget cuts. Ironically, the fruits of those strategic goals helped the OHS deal with the budget crisis by declaring victory in key programs and transferring responsibilities to partners. After years of cultivating friendships with tribal leaders, mutual respect created an opportunity to discuss the fate of two important historic sites. One was Sequoyah’s Cabin, saved by the OHS in the 1930s and continually improved through the decades using state resources. In 2017 OHS and Cherokee leaders agreed the time had come to return that sacred site back to the Cherokee people and the transfer was made.70 A similar story was repeated at Fort Washita, which was deeply embedded in the history of the Chickasaw Nation. Again, OHS and Chickasaw leaders saw an opportunity to improve the site and do the right thing. The land and property were returned to the Chickasaw people.71 In Bartlesville, victory once again was declared when the Phillips Foundation agreed to accept title to the Frank Phillips Home.72 In all three cases, the savings in operational costs were used to support museums and sites where partners did not have the resources to help. After 125 years of collecting, preserving, and sharing state and local history, the Oklahoma Historical Society is still searching for ways to raise standards, improve efficiencies, and attract partners. As this short history goes to press, a campaign is being launched to create a grants-in-aid program that will empower local historical societies and museums to be even better. OHS leaders are planning new exhibits, looking ahead for new opportunities, and reaching out to new partners. In 1893 a small band of journalists meeting in Kingfisher knew they had a unique opportunity to make a difference in the way one community could understand its shared experiences. Since that time, each generation has had a similar opportunity to take that mission to the next level. This short history of the OHS, with all of its ups and downs, challenges and opportunities, proves that great things can be accomplished when people work together, commit to organizational structure, and never give up when times are tough. Oklahoma history is too important to do otherwise. * Bob L. Blackburn is executive director of the Oklahoma Historical Society. A native of Oklahoma, he completed his PhD in history at Oklahoma State University in 1979. He is the author of numerous books, scholarly articles, and several screenplays. He also regularly gives presentations for scholarly audiences, local historical groups, television, and radio. 1 Fred Smith Standley, “The Oklahoma Historical Society, 1893–1943,” (master’s thesis, University of Oklahoma, 1986), 25–32. Standley’s master’s thesis is the best source for information on the society during the early stages of development. He skillfully weaves into his narrative history strong themes of biography, social and political history, and descriptive analysis of trends and concepts. The author acknowledges his gratitude to Mr. Standley for sharing his work and research assistance for this project. 2 William P. Campbell, “Circular One: Office of Historical Custodian, Oklahoma Press Association,” Kingfisher, Oklahoma Territory, May 29, 1893; Mistletoe Leaves (Kingfisher, Oklahoma Territory), August 5, 1893. 3 “Governor’s Message to the Third Legislative Assembly of the Territory of Oklahoma,” January 8, 1895, Territorial Governors Papers, 10, folder A, box 2-A, Record Group 12-1, Oklahoma State Archives, Oklahoma City, OK.
4 Eva Riggins Johnson, “The Oklahoma Historical Society and Its Work,” (master’s thesis, University of Oklahoma, 1926), 2. 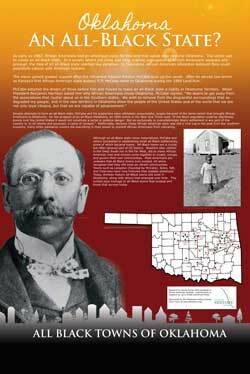 5 Quoted in Standley, “The Oklahoma Historical Society,” 39–40. 6 Session Laws of Oklahoma Territory, 1901, 56. 7 William P. Campbell, “Oklahoma Historical Society, Custodian’s Report,” 1907–08, 7, Oklahoma Historical Society Research Center, Oklahoma City, OK (hereafter cited as OHS Research Center). 8 Johnson, “The Oklahoma Historical Society,” 5–6. 12 Standley, “The Oklahoma Historical Society,” 89–104. 13 Edward Everett Dale and James D. Morrison, Pioneer Judge: The Life of Robert Lee Williams (Cedar Rapids, IA: Torch Press, 1958), 365–73; Session Laws of Oklahoma, 1929, 57–59. 14 Lawrence C. Kelly, “Indian Records,” The Chronicles of Oklahoma 54, no. 2 (Summer 1976): 229–30; Charles Evans, “The State Historical Society and Its Possessions,” The Chronicles of Oklahoma 24, no. 3 (Fall 1946): 254. For the best description of the society’s efforts to obtain the Indian records, see Standley, “The Oklahoma Historical Society,” 139–50. 15 Standley, “The Oklahoma Historical Society,” 145; US Congress, “An Act to Authorize the Secretary of the Interior to Place With the Oklahoma Historical Society at Oklahoma City, Oklahoma, as Custodian for the United States, Certain Records of the Five Civilized Tribes, and of Other Indian Tribes in the State of Oklahoma,” March 27, 1934. 16 Standley, “The Oklahoma Historical Society,” 153–55. 17 A. M. Gibson, ed., The West Wind Blows: The Autobiography of Edward Everett Dale (Oklahoma City: Oklahoma Historical Society, 1984), 346–47; Grant Foreman, “The Oklahoma Historical Society,” pamphlet, vertical files, OHS Research Center; “Indian-Pioneer History Project, W.P.A. 131,” The Chronicles of Oklahoma 37, no. 4 (Winter 1959–60), 507–09. 18 Standley, “The Oklahoma Historical Society,” 158–59. 19 Session Laws of Oklahoma, 1949, 691–92; Minutes of the OHS Board of Directors, February 1949. 20 Minutes of the OHS Board of Directors, January 1952, November 1951, April 1952, October 1952. 21 Session Laws of Oklahoma, 1953, 445–49; Session Laws of Oklahoma, 1957, 599–600; Session Laws of Oklahoma, 1951, 248. 22 Session Laws of Oklahoma, 1957, 452; Minutes of the OHS Board of Directors, April 1957, July 1957, July 1958. 23 Minutes of the OHS Board of Directors, October 1959, July 1960, January 1962. 24 Session Laws of Oklahoma, 1967, 423. 25 Minutes of the OHS Board of Directors, January 1967, April 1967. 26 Minutes of the OHS Board of Directors, October 1967, January 1968, April 1968, July 1968, July 1969. 27 Minutes of the OHS Board of Directors, April 1970, July 1971. 28 Minutes of the OHS Board of Directors, February 1972, October 1972, April 1973. 29 Minutes of the OHS Board of Directors, June 1973, April 1974, October 1974, January 1975; Session Laws of Oklahoma, 1975, 699–701. 30 Minutes of the OHS Board of Directors, October 1952, July 1970. 31 Session Laws of Oklahoma, 1949, 691–92; Minutes of the OHS Board of Directors, February 1949. 32 Minutes of the OHS Board of Directors, July 1949. 33 Session Laws of Oklahoma, 1957, 596–97; Minutes of the OHS Board of Directors, April 1957, April 1958. 34 Minutes of the OHS Board of Directors, January 1945, January 1946; Charles Evans, “Quarterly Staff Report, OHS, July 15, 1959,” 4–5, OHS Research Center; Session Laws of Oklahoma, 1969, 406. 35 Minutes of the OHS Board of Directors, November 1951, July 1956, July 1976. 36 Minutes of the OHS Board of Directors, July 1942. 37 Minutes of the OHS Board of Directors, April 1971. 38 Charles Evans, “Oklahoma State Historical Society,” (Oklahoma City: Oklahoma Historical Society, n.d.), booklet, OHS Research Center. 39 Evans, “Quarterly Staff Reports,” April 15, 1959, through April 20, 1960. 40 Minutes of the OHS Board of Directors, October 1972, January 1974, January 1975. 41 Minutes of the OHS Board of Directors, July 1978, October 1978, July 1979, April 1980. 42 Kenny A. Franks, You’re Doin’ Fine, Oklahoma! A History of the Diamond Jubilee, 1907–1982 (Oklahoma City: Oklahoma Historical Society, 1983), 61–70; Interviews with OHS staff members, September through December 1992. 43 “Annual Meeting Files, 1986–1993,” Office of the Deputy Director, Oklahoma Historical Society, Oklahoma City, OK.
44 “Membership Files,” Development Office, Oklahoma Historical Society, Oklahoma City, OK.
45 Minutes of the OHS Board of Directors, April 1971; “Publication Files,” Publications Office, Oklahoma Historical Society, Oklahoma City, OK.
47 Minutes of the OHS Board of Directors, October 1972. 48 Minutes of the OHS Board of Directors, October 1975; interviews with OHS staff, December 1992. 49 Franks, You’re Doin’ Fine, 61–70. 50 Interview with OHS staff, January 1993. 51 Oklahoma Historical Society Constitution, Art. V; Minutes of the OHS Board of Directors, March 1981. 52 “Historic Context Review,” Office of the Executive Director, Oklahoma Historical Society, Oklahoma City, OK.
53 Minutes of the OHS Board of Directors, July 1991. 54 Minutes of the OHS Board of Directors, January 1994, April 1995. 55 “Cost-Benefit Analysis,” Office of the Executive Director, Oklahoma Historical Society, Oklahoma City, OK.
56 The Daughter of Dawn, directed by Richard Banks, written by Norbert Myles (Texas Film Company, 1920; Harrington Park, NJ: Milestone Film & Video, 2016). 57 The Encyclopedia of Oklahoma History and Culture, www.okhistory.org/encyclopedia. 58 Minutes of the OHS Board of Directors, January 1997, April 1998. 59 “Society Unveils Proposed Museum,” Friday (Oklahoma City, OK), February 6, 1998. 60 “OKC Firm to Design New $46 Million Museum,” Ponca City (OK) News, April 22, 1999, 1. 61 “Lawmakers Craft Bond Issue for History Center,” Tulsa (OK) World, May 8, 2003. 62 “Smithsonian Affiliate Directory,” Smithsonian Affiliations, affiliations.si.edu/about-us/affiliate-directory; “Affiliated Archives,” National Archives, www.archives.gov/locations/affiliated-archives; “Museums Committed to Excellence,” American Alliance of Museums, ww2.aam-us.org/resources/assessment-programs/accreditation/accredited-museums. 63 The Gateway to Oklahoma History, gateway.okhistory.org; OHSfilm, www.youtube.com/user/OHSfilm/videos; The WKY KTVY KFOR Archives brought to you by the Oklahoma Historical Society, www.youtube.com/user/kforarchives. 64 “Tulsa Race Riot: A Report by the Oklahoma Commission to Study the Tulsa Race Riot of 1921,” February 28, 2001, www.okhistory.org/research/forms/freport.pdf. 65 Minutes of the OHS Board of Directors, October 2008. 66 Rebecca Cantrell, “Gov. Fallin Signs Bill Funding OKPOP Museum,” KFOR, May 29, 2015, kfor.com/2015/05/29/gov-fallin-signs-bill-funding-okpop-museum. 67 John Klein, “Local Help Saves Oklahoma Historical Society Sites Amid Decade of State Funding Cuts,” Tulsa World, March 3, 2018, www.tulsaworld.com/news/columnists/johnklein/local-help-saves-oklahoma-historical-society-sites-amid-decade-of/article_6f990223-4c6b-50da-adf1-3c3f3d2ecdbe.html. 68 “Hostile takeover disguised as consolidation,” Mistletoe Leaves (Oklahoma City), April 2014, 1. 69 “Reception Honors Lew Ward Family,” Oklahoma Historical Society, www.okhistory.org/about/pressrelease.php?id=756. 70 “Sequoyah’s Cabin transferred to the Cherokee Nation,” Mistletoe Leaves, January/ February 2017, 5. 71 “Fort Washita transferred to the Chickasaw Nation,” Mistletoe Leaves, November/December 2017, 7. 72 “Frank Phillips Home to Change Ownership,” City of Bartlesville, www.cityofbartlesville.org/10818-2.